Franklin & Marshall sports teams performed extremely well over winter break. All seven teams had either a winning or 500 record. The Diplomats’ excellent performances allowed some teams to turn around a losing record and help other teams continue to pile more victories on to their winning records. The women’s basketball team had an impressive stretch over winter break. The Diplomats were not deterred by their 3-5 record; instead they showed resilience and fought to turn their record around. The women’s basketball team traveled to California and were able to cruise past Grove City and UC Santa Cruz. Upon their return, they suffered a loss against their Centennial Conference competitor, Ursinus. 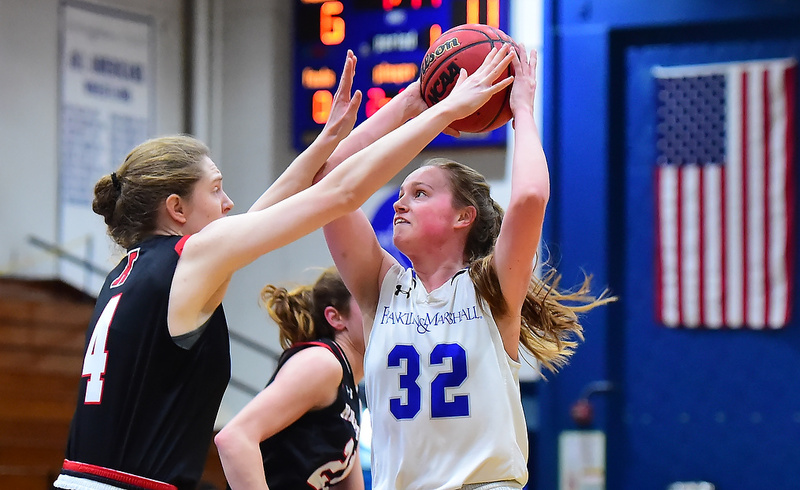 However, with the help of their leading scorers Kristin Hamill and Haley Pilone, they rebounded and had three dominant victories against Washington, Bryn Mawr, and Muhlenberg, defeating each of these conference opponents by at least 10 points. The men’s basketball team was able to tack on three victories over the break to increase their 6-3 record to a 9-6 record. The Diplomats competed in the Sponaugle New Years Tournament. In the semifinals, they dominated over Delaware Valley to advance to the finals to face-off against Rowan. The Diplomats defeated Rowan 68-63 with the help of Justin Kupa who made the final two free throws of the game to extend their lead to a two possession game. However, the men’s basketball team had three tough losses against Washington, Muhlenberg, and Ursinus, losing to Washington and Ursinus by 3 points and 2 points, respectively. Similar to the women’s basketball team, the women’s squash team made a spectacular turn around over the break. Starting off their season with a 2-3 record, the Diplomats won their match against Hamilton 6-3 with the help of hard-fought battles from Ellen Verry and Pratiksha Mishra, both winning their match in 5 sets. The women’s squash team also defeated St. Lawrence (8-1) to improve their record to 4-3. The men’s squash team had a tremendous start to their season, going 5-1. They were able to continue their success by going 2-1 over the break. The Diplomats had dominant victories against Hamilton (9-0) and Hobart (8-0). In both of these matches, all of the Diplomats defeated their opponents in three sets. They lost a close match against St. Lawrence (3-6). Going into the winter break, the men’s swimming team had a record of 4-2 and had an impressive performance in the F&M Invitational, coming in first or second place over the course of three days. Over the break, the Diplomats defeated Susquehanna by a large margin (160-101). The Diplomats placed first in the 400-yard freestyle relay composed of Christopher Schiavone, Timothy Gould, Brendan Cline, and Daniel Sanders all of whom had top finishes in individual races. The men’s swimming team lost to WPI 118-143 to finish up the break with a 5-3 record. The women’s swimming team were undefeated over the break, defeating both of their opponents to improve their record to 6-3. The women’s team defeated Susquehanna by an extremely narrow margin of 131-130. Tara Kupsky had 2 first place finishes. Erin Fago and Leah Williamson both had one first and one second place finishes to help lead the team to victory. The women’s swimming team dominated over WPI, defeating them 142-119. Although both women and men’s track and field have yet to have meets that count toward their records, Franklin & Marshall hosted a Coach I Open on January 12. On the women’s side, the 4x400m relay (Kaitlin Muccio, Rachel Wylie, Emily Natoli, and Jillian Rotman) came in second place with a time of 4:20.42. On the men’s side, Ryan Braun came in second place in the 800m with a time of 2:00.86. Wrestling pummeled Davidson in their first match of the break, defeating them 35-4. Their match against Gardner-Webb came down to the wire, as they won 21-19. The Diplomats lost to Campbell 12-29. The Diplomats look to continue their hot streaks as their second semester seasons begin.